In honor of December, and HPZ’s annual “White Christmas Pre-Christmas Countdown to Christmas,” I present a head-to-head match-up of music that I hope will inspire just a tiny bit of wintery precipitation to fall before too long. So in a similar vein to HPZ Co-Star Paul Snyder’s “Vs.” music blog series, I hereby present: “Snow” Fight! 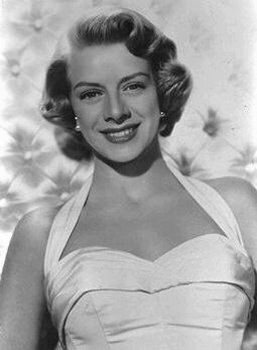 The basis for such a debate stems from a contract dispute that kept White Christmas star Rosemary Clooney off of the semi-official movie soundtrack recording. Clooney, a successful artist in her own right by 1954, was signed into an exclusive contract with Columbia Records. Meanwhile, Decca owned the rights to the music used in the film. As a result, Clooney was pulled from the Decca recording, despite being an integral part of the White Christmas cast. She was replaced by Peggy Lee. You might remember this scene from the film: Bob Wallace (Bing Crosby), Betty Haynes (Clooney), Phil Davis (Danny Kaye), and Judy Haynes (Vera Ellen) are on a train bound for Vermont, and one thing they can’t wait to see is snow. So of course they sing about it. And in case you couldn’t guess from the fact that Vera Ellen’s voice magically drops an octave whenever she sings, her voice is dubbed by singer Trudy Stevens (Ellen was famous for dancing, not singing). But what to make of the recordings released after the film’s production? From the Decca label, we are treated to a version of “Snow” that contains the same four-part harmonies as in the film — and even an orchestral interpretation of a choo-choo train — but Peggy Lee magically appears and Clooney is nowhere to be heard. Meanwhile, Clooney recorded her own solo version of the song with a softer orchestral accompaniment in the background, sprinkled with back-up vocals by an anonymous chorus of male singers. The four-part harmony is lost, but this arrangement has a smoother, more lighthearted quality to it. Given that there was never an “official” soundtrack for the film, we must settle for alternate recordings. So which do you think is better — a musical arrangement that sticks pretty closely to the original score but swaps one big-name girl singer for another, or one that allows the film’s original star to exercise her talents on a song she’d earlier been barred from recording with her castmates? 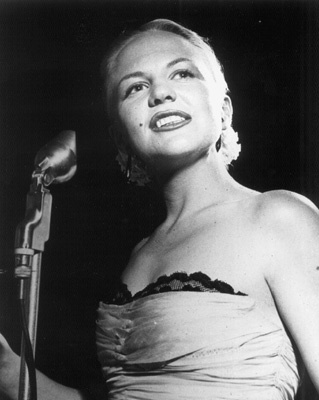 Is anything lost by plucking Clooney out of the Decca recording and plugging in Peggy Lee? Is Clooney’s solo recording undermined by the absence of Crosby, Kaye, and Stevens? Take a listen to these tracks & vote for your favorite! Poll was closed and MP3s were removed on Saturday, December 5, 2009. “Snow” by Crosby, Kaye, Lee, and Stevens: This version is up beat and reminds me of classic carrols crooning about sleigh rides and fun times. Perfect for getting you up and about and motivating you for that dreaded holiday shopping. The blend of voices works quite well too, and Lee’s lower register blends very nicely with Crosby. “Snow” by Rosemary Clooney: This version almost feels a little like a reprise to the foursome’s version. Definatly less energetic than the foursome I picture listening to this while sipping hot chocolate next to a warm cosey fireplace. Clooney also seems to slide into each note which gives the peice a much more flowing sound. I think which version is “better” definatly depends on the circumstance you find yourself in when listening. Since I prefer to be energized by my music I’ll have to go with the foursome.